Kirk Mohney, Architectural Historian, of the Maine Historic Preservation Commission, contacted us last year and proposed designating a portion of downtown Cherryfield as an historic district. Tom Campbell and Bill Conway met with Mr. Mohney and were able to provide sufficient documentation on the older houses for the application to be accepted at the State level. The Commission then submitted the application to the National Register of Historic Places, where it was approved on October 1, 1990. The District is comprised of two areas, one on either side of the Narraguagus River. The section on the east side of the river encompasses the area from the south side of Church Street (two houses at the top of the hill) to the corner of Park Street & New Street (including Ricker House and the Grant home) and the houses on Campbell’s Hill and High Street. The section on the west side of the river starts with the G. R. Campbell (Hamilton) house and continues south to the former Baptist Parsonage, the Nash Building and the Masonic Hall. Many of the houses and other buildings in the district have already been placed on the National Register individually. The Society is interested in obtaining information on more of the houses and buildings in the district – date built, occupants over the years, businesses connected with the building, etc. Owners of the houses are entitled to a certificate from the Historic Preservation Commission certifying that the house is in the District. Owners of the property have received letters from the Society containing further information on obtaining the certificates and requesting data on the properties. A map of the area is printed on the next page of this newsletter. A genealogy seminar was held this summer at the Cherryfield Elementary School conducted by Ronald Bremer of Salt Lake City, Utah. Mr. Bremer covered many topics in answer to questions from the audience and provided a wealth of information on research sources and methods. The Society purchased the Compendium of Historical Sources for reference as a research tool and which can be used by contacting Margery Brown* Some members of the Society also purchased the Seminar Transcript (a transcript of an all-day seminar) which contains many sources and Chaos and Confusion by Vincent L. Jones which is extremely helpful in teaching how to organize notes and other materials. Approximately thirty people attended the seminar and were enthusiastic about the results. A full-day seminar will be scheduled for the summer of 1992. Percy W. Willey, Jr., of Franklin, has been working at copying more census records for us. He has done an index to the 1850 census which is extremely helpful. Others that he has completed are 1900 for Milbridge, Beddington, Deblois, Devereaux Township, and Harrington, and 1910 for Harrington; 1880 for Addison, Columbia, Columbia Falls, Mi1bridge and Steuben (these 1ast being incomp1ete because of the poor quality of the microfilm). Copies of all of these can be researched by contacting Margery Brown. The New Brunswick Provincial Archives is beginning a microfilming project and will be starting with the Narraguagus Times (1897-1906) newspapers which have been kept at the county courthouse in Machias. The Society will be purchasing the microfilm as soon as it is aval1able-Microfi1ms require a “reader”, so if anyone knows of one which might be available for purchase or donation, please let us know. Most of our acquisitions are items which have been donated by persons who are interested in preserving artifacts of local interest. The Society has, however, established a small fund for acquiring items which might be sold at auctions or yard sales which are unique to Cherryfield. One such item was purchased this summer from an antique dealer – the seal of the Cherryfield Grange, a beautiful item in the shape of a lion’s head in black and gold enamel. Members who find such items can purchase them and be reimbursed by the Society for a reasonable amount for the item (not to exceed $200.00). The Boston Post Cane has recently been presented to Howard Strout as the oldest resident of Cherryfield. The previous holder of the cane was Frank Guy Morse, who will be greatly missed by all of his family, neighbors and friends. The building was lowered onto concrete posts by our volunteer group headed by Dan Ladrigan. Painting has been done by Carlton Wi11ey and A1ton (Pete) Grant. Necessary repairs wi11 be done next year and wi11 inc1ude 1attice work around the bottom. Some progress has been made in obtaining rails and other supplies for setting up a display near the bui1ding — more on that next summer, a1so. The museum was open all day on June 30th (Parade Day), as was “Pat & Mike’s” frankfurter stand. The help of so many volunteers to keep the building and the concession going is greatly appreciated. This is our major fund-raiser for the year, so we work very hard on making it a success. We were ab1e to have the museum open on Wednesday and Saturday afternoons during July and August, also, and will continue to do this annually if sufficient volunteers are available. The origina1 co1ors of the bui1ding (when we received it, at least) were restored when the building was painted this summer – gray with green trim, which matches the railroad station building. The previous cream trim had seemed to co11ect dirt terribly and cou1dn’t be cleaned. Cherryfield Grange #256 was organized September 28, 1888 and probably closed in the late 1930’s or early 1940’s. The Grange Hall was 1ocated just west of Wayne Smith’s dairy farm on the Wi11ey District Road. Cherryfield had a second grange, Washburn Grange #91, located on the Ridge Road. This grange was organized sometime around 1912 and has just recently merged with Osceola Grange of Harrington. The Cherryfield news in the Bangor Daily News of April 1918 lists the election of officers of Narraguagus Grange which probably was located in either Beddington or Deblois, as the names of the officers would indicate: “Saturday evening April 26, Master, Wilbur Merritt: Overseer, Cora Cakes: Steward, J. W. Schoppee: Lecturer, Mrs, Bertha Grant: Chaplain, Carrie Lancaster: Treasurer, Leander Grant: Secretary, Evie Oakes: Assistants, Hazel Wilson, Helen Oakes: Gatekeeper, Ward Torrey: Mertie Wi1son, E11en Smith and Mer1e Norton, court officers” More information on this grange would be gladly received by the Society. A letter dated April 18, 1844 from J. W. Moore to his son, Sam, contains the following passage: “I feel poorly today having been summoned to witness at two o’clock 1ast night the burning of A, Campbell & Co. Mills at Stillwater. The fire is thought to originate from overheating some of the boxes be1ow …… was not noticed by the workmen when they 1eft the mi11. The Gang, Single Saw and Lath mill and some small machinery, all that was located on the Western End, was entirely consumed – and some lumber. Loss to them of $20,000 and as much more to the 1abouring community”. The Society voted to spend some monies on the cleaning and straightening of stones in the Old Cemetery near the Town Hall. The Selectmen approved a portion of the money from funds available for such work. Fred Wieninger, of Wieninger Monumental Works, did as much work as possible for the funds provided. The stones are much improved in appearance and the Society plans more work for future years. Bill Conway and Ed Mueller were able to straighten some stones, also, but found it a very time- consuming project. Two hundred and nine individuals are listed on the some 175 stones in the cemetery – very few descendants are left in the area. A sign has been installed indicating both the present name and the original name (Hill Cemetery) used when the land was still in Steuben. The ADOPT-A-PLOT program is still in progress since the total cost of cleaning and straightening stones in the entire cemetery may run as high as $4,000 – $5,000 (the cemetery had been neglected for so many years that the stones are in terrible condition – some broken beyond repair) and help from any source will be appreciated. Once the stones are cleaned, a thorough and proper washing every few years will keep them in good condition. A considerable amount of filling of holes and uneven places needs to be done, also. Anyone who wishes to make a financial donation should send it to the Society and specify that it is for the Cemetery Fund. Kathy Upton adopted the Jeduthan Upton lot and began research on the family. Jeduthan was a veteran of the Revolutionary War. Kathy traced his family back to Salem, Mass. and found that he was descended from the same immigrant as her husband’s family which had migrated to Canada. She also found that Jeduthan, and later his son John, were inn holders in Cherryfield. This type of information could later be compiled into a book for publication about the various families who are buried in the cemetery. Each year, we try to ascertain the oldest and youngest descendants of Ichabod Willey now living in Cherryfield as of July 4th. This year the oldest is Herbert A. Willey and the youngest is Briania Santerre. “The most lively runaway occurring this season was witnessed from the TIMES office Wednesday morning when a span of horses attached to a jigger came running wildly down Campbell hill. The team, owned by Geo. Lawn, of Harrington, was in the yard of Dr. Nickels taking on the Doctor’s outfit for Point Ripley where his family will pass the season. By some means the horses became frightened and before the driver could reach the lines were on the way out of the yard into the street. When part way down the hill the jigger unshipped and the runaways with the front wheels turned the square and continued up street to the Upper Corner where they were brought to a stop. The outfit, which was a miscellaneous stock of groceries, canned goods and trunks of clothing, was scattered along the route in a badly damaged condition, and for nearly an hour a shower of granulated sugar continued to fall in front of the TIMES office. The doctor says he would give five dollars for a picture of the ice chest as when he saw it descending to earth from up among the prophets”. The April meeting each year is the one at which officers are elected for the ensuing year. The meeting was held at the Alexander Campbell House, home of John and Pat Brace. The following officers were elected: President, Margery Brown; Vice-president, Florence Boorse; Secretary, Joanne Willey; Treasurer, Cheryl Brown. Allen Savage, Reuben Wood and John Brace were elected Directors. Scout Den and Webelos Den in Cherryfield. Other dens are in Milbridge and Harrington. Some of the boys will be old enough for Boy Scouts next year, so leaders are needed. Contact Cheryl or Larry Brown (546-2841) if interested in volunteering. Eight of the boys will be going to Cub Scout Camp this summer. This edition of the newsletter was mailed by first class mail (rather than the usual non-profit mailing). Efforts to maintain correct addresses on the mailing list are not always successful, so every few years a “first-class” mailing is done. Undeliverable mailing is returned and those names can be dropped from the mailing list. It is extremely important to notify the Society of an address change as the non-profit mailing is not forwarded. This edition also contains information on the 200th anniversary of the Alexander Campbell House, so prompt delivery seemed to be a top priority. Another important item in this edition is the genealogical seminar scheduled for August – early notification gives plenty of time for making plans to attend. This seminar will be held at the Cherryfield Elementary School on Saturday, August 4th from 1:00 – 3:00 p.m. The seminar is entitled “The World of Genealogy” and will be conducted by Ronald A. Bremer of Salt Lake City, Utah. It will include such topics as: Introduction & Organization; Speeding up your Genealogy? Little Known Sources; Laws & Rules of Genealogy; and Questions & Answers. Mr. Bremer is a very dynamic speaker, is well versed in all aspects of genealogical research, and has over 40 years experience in the field. His lecture covers all phases of research from serious to humorous. Don’t miss this opportunity to attend the seminar and to ask questions. A $1.00 donation per person is requested to cover the use of the facilities. Please feel free to bring a tape recorder or video camera. Refreshments will be served after the meeting and Mr. Bremer will have copies of his various publications available for purchase. The quarterly meeting will be held on Saturday, June 23rd at Mount Desert Island High School in Bar Harbor from 8:30 a.m. to 3:30 p.m. This is the first meeting of the Maine Genealogical Society in this area. The MDI Chapter of MGS is the host for this event. Research in Eastern Maine and the Maritime Provinces of Canada will be the focus of the meeting. Margery Brown, President of C-N HS has been invited to speak on Western Washington County Research. These meetings are always very interesting and informative, so try to attend. WLBZ-TV will again sponsor this event which will be held on Saturday, June 16th at the Pickering Square Parking Garage in Bangor. This sale is open to booths from non-profit organizations only. Although a small number of items were available for sale last year, the Society made a tidy profit. Items can be donated anytime up to the date of the sale (call Margery [546-7979], Joanne [546-7937], or Larry [546-2841]) and arrangements will be made to pick them up at your convenience. New items are not allowed; good second-hand items are allowed; books and records are always good; flea-market items are not allowed – keep this in mind when donating. Since this is an all-day affair, volunteers are needed who are willing to spend an hour or two at the Society booth. Contact Margery, Larry or Joanne if you are interested in helping with this event. The restoration project halted suddenly when Mother Nature took us from “Indian Summer” to “Dead of Winter” with such speed. The concrete posts are in place under the building and the next step is to lower the building onto them. Dan Ladrigan is in charge of this project and will be glad to hear from any volunteers. Once the building is firmly set onto the posts, the other restoration work can begin; repairing clapboards, installing the signal arm, chimney work, painting, etc. Alexander Campbell came to the Steuben area between 1766 and 1768 and built a lumber mill on the Tunk River. He later moved his mill to the Narraguagus River in Cherryfield and, by 1775, had acquired over 200 acres of timberland in the area. 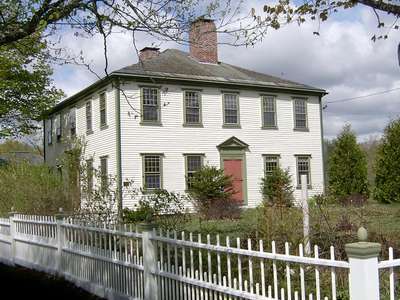 Following his service in the American Revolution, he returned to Cherryfield and, in 1790, built his home on Campbell’s Hill in Cherryfield. Alexander Campbell died in 1807. Samuel Campbell (1775-1833), son of Alexander, was the next occupant. After his death, the house was remodeled for two families. Samuel’s widow, Rebecca, and their son, Francis, lived in one part; their son, Alexander and his family, in the other part. Rebecca died in 1870 and Francis died in 1872, leaving the entire house to Alexander. About 1880, Alexander built a large home across the road to the south and gave his old home to his son, Fred I. Campbell. The bay windows were added to the house in 1889 by Charles Allen, a well-known builder of the area. Fred I. Campbell died in 1909; his widow, Josephine lived there until her death in 1932. The home was then used by the descendants of Fred and Josephine as a summer residence for many years. In 1975, John Brace (grandson of Fred; great-great-great grandson of General Alexander) became the sole owner of the home where he and his wife, Pat, now reside. The date of Saturday, August 18, 1990, has been set for an anniversary celebration for the house. Current members of the Society and guests are invited to attend the party from 1:00 – 4:00 p.m. Since space is somewhat limited, a reply section is included with the order form at the end of this newsletter – this is for tentative plans only and not to be considered a firm commitment. The Brace’s will be acting as hosts for the party with assistance from members of the Society. The Methodist Episcopal Church was built on property obtained by its trustees (William Burnham, James A. Campbell and William B. Nash) for the sum of $100.00 from William B. and Tryphena Nash. The lot contained thirty-nine and one-quarter rods and the deed was recorded in Vol. 50, Page 444, Washington County Registry of Deeds, June 10, 1843 at 7:00 a.m. This lot is the site of the present American Legion Hall. Among the other papers contained in a box donated by descendants of William B. and Tryphena Nash was a paper giving permission to David W. Campbell to enter upon the lot of the Methodist Meeting House in front of said Meeting House to lay an aqueduct in and across said lot for the purpose of conveying water to the house of David W. Campbell and to enter upon the lot at all suitable times for repair of said aqueduct so long as he or his heirs and assigns shall maintain the same. Witnessed the 5th day of May 1868: Daniel E. Nickels, William B. Nash and Alfred Small. This must have been the same aqueduct line that was dug up by Joseph Sproul at the time the parking lot was put in behind the Union Trust Company bank. We have a section of that line in our museum. The water line must have run from a spring on the hill behind the Academy Building, in front of the Methodist Church, behind the Baptist Church and the Cherryfield House Hotel (present site of the Union Trust Company) to reach the Campbell House, now the home of Barbara Patten. Several springs, some from as far away as the southwestern slope of Willey Hill, were piped into houses along Main Street. Bill Conway and John Brace have met with Fred Wieninger, of Wieninger Monumental Works, and discussed the straightening and cleaning work to be done at the Old Cemetery. Fred made a very reasonable offer for doing the necessary work by dividing the cemetery into sections and working on one section at a time (the reduced rate offered was to be considered Fred’s contribution to the project). The Society voted to spend the money to have one section done last fall, but the early onset of winter prevented that from happening. Charles Tenan offered a load of gravel – to be delivered as soon as it stopped raining – the rain, however, was followed by a blizzard. The present plan is for the committee and all available volunteers to right and reset the stones for cleaning in the fall when Fred has some spare time. Any unbroken stones can be reset once the ground thaws making them easier to clean. Bill Conway, Chairman of this project, is recovering from recent open-heart surgery. If you wish to volunteer for the project, please call Margery (546-7979), Eleanore Mueller (546-2883), or John Brace (546-2101). We wish Bill a speedy recovery. The Maine Historic Preservation Commission is interested in designating the area which comprises Park Street, New Street, Campbell Hill, High Street and Main Street (to the Upper Corner and beyond), and some portions of the West Side of the River as an Historic District. Kirk Mohney, Architectural Historian, will be in town this spring to document the houses. Bill Conway and Tom Campbell are working on this project. Marjorie Allen, a graduate of Cherryfield Academy and resident of Portland, Maine, won the gold coin which was raffled at the time of the 225th anniversary celebration of the Town of Cherryfield. The coin has now been donated to the Society and is a very much appreciated addition. Two hundred and twenty-five silver coins were struck and each was numbered. Five hundred pewter coins were made and a few of those are still available. Charlotte Ricker, daughter of Mark & Florence (Dean) Ricker and niece of George Ricker (Cherryfield’s blacksmith for many years) died in October of 1989. She had been a member of this Society since 1977 and, although she lived in Haverhill, Mass., had kept continuous contact with her family roots in Cherryfield. She and her sister, Virginia (who died in 1986), had attended the open house at Ricker House (one of the old family homes) in 1985 and displayed a scrapbook which Charlotte had been compiling on the family history. Charlotte and Virginia had acquired many items from the Annie Ricker house on Church Street and the Abbie Ricker (Helen and Lucy Emery) home when the estates were settled. Charlotte felt that those items should be returned to Cherryfield and made arrangements for donating them to the Society where they will be displayed later. A 38-year employee of AT&T Bell Labs, Charlotte was also an organist and choir member of her church, member of many historical and genealogical societies (including the Maine Genealogical Society and the Maine Old Cemeteries Association) and a dedicated genealogist. In addition to the items of Ricker historical value which have been returned to the Society, Charlotte made a gift to the Society in her will of $10,000.00 which will be used for acquiring historical and genealogical data of the town and surrounding area. These funds will enable the Society to pursue this goal much more actively and will continue work which Charlotte had accumulated on the Ricker family. Officers for the ensuing year are elected at the April meeting each spring. Some of us would really like to have other members come forward to take offices in the Society. This year, however, continued the pattern of the past few years and the following were elected: Margery Brown, President; Florence Boorse, Vice-President; Joanne Wiliey, Secretary; Cheryl Brown, Treasurer; Allen Savage, Reuben Wood, and John Brace, Directors. We are very pleased each year with the participation of the students and the variety of subject with which they deal. The winners this year were all concerned with subjects familiar to each student’s family history and were well researched and contained much information acquired through personal interviews. We all find that we learn much about the local area from each of these essays. This spring we have been very fortunate to have Dan & Marcia Ladrigan, new owners of the old Grammar School building, take an interest in this project. Mr. Ladrigan offered his services and those of his company to review the project and estimate the cost for setting the building on a foundation of posts. The estimate for materials is $1,000.00, and some labor will have to be hired for digging the holes. We hope to be able to get this job done soon, so that the building can be painted this summer and made to look more presentable. WLBZ is holding a gigantic yard sale at the new Bangor Parking Garage. This sale is open to non-profit organizations only and will be held on Saturday, June 17th. Bill Conway has volunteered to represent us at the sale where we will be able to sell our publications and other items. We would appreciate receiving any “good” items which could be sold. We have been notified that “flea market” type items will not be allowed and brand-new goods will not be allowed. Anyone having suitable items should contact Margery or Joanne. Blueberry Ford, Inc. (new owners of the Ford franchise in Cherryfield) has been contacted about removing vehicles from the lot next to the museum. Plans are to clean up and landscape that area before summer. We very much appreciate the cooperation of the company in removing their vehicles so promptly. “Downeast Dicksons” by Katharine Dickson which is concerned with the Harrington Dickson and allied lines, has been presented by the author. Further information on this book may be obtained by contacting Katharine Dickson Brown, R. F. D. 1, Henniker, NH 03242. Member Gary W. Wilson, P. 0. Box 1892, Portland, ME 04104, has offered to help other members who are interested in lines he is researching – Curtis, Connors, Dyer, Dorman, Fickett, Harrington, Hartford, Hutchinson, Ingersoll, Keith, Leighton, Libby, Parker, Pinkham, Ridley, Rumery, Sawyer, Shaw, Shorey, Smith, Trundy, Tucker, Warren, West, Whitten and Wilson. Mrs. Kay Stevens, 4423 Newport Woods, San Antonio, TX 78249 would like to know where the Masonic records for Maine are kept. She is trying to locate the place and date of marriage of Wilmot W. Nash (1831-1861) of Cherryfield and Clara V. Orcutt (1833-1894), who was born in Bucksport. The following obituary appeared in the-Portland Press Herald and was sent to us by Marjorie Allen, a member of the Society. It may be of interest to those researching the Small family. Dated: Windham – Jennie Handy Roy, 103, died at the home of Ella Young on the Cook Road Thursday. She was the widow of John T. Roy. She was born in Cherryfield January 5, 1885, a daughter of William and Mary Small. She lived at one time in Waldoboro, then moved to Portland, where she lived for 60 years. After leaving Portland, she lived with a niece, Marion Savage, in Melrose, MA, for seven years and then moved to Windham three years ago. Survivors include a sister, Nena Larochelle of Melrose, MA, five nieces and a nephew. Burial will be in Brookland Cemetery, Waldoboro. We have acquired two pictures of local baseball teams which require some identification. One is a postcard of the Academy (?) team with one older man wearing a suit, tie and wedding ring (coach?). Two of the other eight people have “C A” on their shirts, one has “C” on his jacket and one has “Highland” on his jacket. The card was mailed in 1915 to Mrs. John Sproul, Cherryfield, and was from “Effie”. The postmark was “Calais & Bangor” so must have been canceled aboard the train. This card came from a collection of papers given to us from the Joseph Ramsdell house – John Sproul was Mrs. Ramsdell’s father. The other picture is marked “Cherryfield B.B. Team, 1913”. One person is dressed in a suit and one has a suit coat on over his uniform. The others have an baseball uniforms with “C” on the shirts. Frank Winslow, of Cherryfield, made postcards of most of the surrounding towns as well as hunting camps, mountain tops and ponds. None from the area around Deblois and Beddington have come to our attention. If anyone has any from these areas, we would like very much to borrow them to have copies made. The Northeast Archives of Folklore & Oral History at the University of Maine is compiling a book (project publication date, September 1989) of the derivation of Maine place names. They are interested in unusual names given to sections of towns* anecdotes connected with the names, etc. They had heard of our “Devil’s Garden” and information has been forwarded on that. Anyone having knowledge of other places, such as streets, hills, or special places with stories connected, contact us and we will send the information along. The Maine Chiefs of Police Association has undertaken a project to erect a permanent memorial to those law enforcement officers who have lost their lives in the line of duty in this state. They have contacted historical societies in hopes of locating those men who died prior to the turn of the century. These records might be found in personal family histories, old newspaper accounts, or other materials. Anyone having information on any officer killed in the line of duty should send the information to us and we will forward it to the Association. “The Vessels of Way Down East” by Joyce Kinney of Eastport is a recent addition to our library. This is a very well researched book that covers all of the ships built in the towns east of Machias. The book is 8 1/2″ x 11″, soft cover, 156 pages with many illustrations of ships and related papers. The book is available from Mrs. Kinney for $20.00 pp. Willey: Beatrice, Doris, Eva and Earnest Mr. Champagne found this in a box of papers he bought at an auction in Bremen, ME. Alice Riley’s sister was married to a minister who served churches in the Knox County area which would account for this card being there. Alice married E. A. Coffin of Harrington between 1902 and 1905. Margaret Kelley Ashe Colton, 92, of Milbridge, ME and New Britain, CT, died 26 Dec 1988 in Redding, CA where she had lived in recent years to be near her daughter. Mrs. Colton will be remembered by many genealogists for the tremendous amount of research she has done on Washington County families over the past fifty years. She had given copies of her work to this Society, as well as the Bangor, Steuben and Machias libraries. She was active with the Maine Historical Society, Maine Old Cemetery Association, and a member of the Hannah Weston Chapter, DAR. Mrs. Colton said she always took her suitcase of genealogical records with her when she spent winters in California and summers in Maine and Connecticut. She found that family research was more entertaining than television. She spent a good part of her winter time in the Los Angeles Public Library genealogy room. The time eventually came when she could no longer drive to the west coast, but she enjoyed flying and her suitcase of records went with her. Historical Society Museum and Hot Dog Stand Open Kids Games – Blueberry Pie Eating Contest Cherryfield Follies – “The Kid in All of Us” Sunday: “Glory Land Quartet” – Church of the Open Bible Softball Tournament – Elementary School Field Salmon Run —- – Narraguagus River Rally Anyone with other events planned should contact Ruth Curtis (546-7416) as soon as possible. The 77th reunion of the Cherryfield Alumni Association will be held on Saturday, June 3rd at the Cherryfield Elementary School. The festivities will begin at 2:00 p.m. with a gathering to meet and greet old friends and classmates. Please bring your old yearbooks and pictures. The evening activities begin at 6:00 p.m. with a banquet, followed by the business meeting and a dance. Joe Foster will be the toastmaster this year and music for dancing will be provided by Larry Smith and his orchestra. The Historical Society now has a building of its own. The former Carleton Willey store on Main Street was donated to the Society by the Bar Harbor Banking and Trust in August. This store consists of two buildings that had been connected so that the first floors could be used as one store. One buildings referred to as the Monohan Store, has deteriorated to the point where it must be torn down. The other, known as the Patten Building, is basically sound. Work was started this fall to replace the necessary sills and jack the building back in place. It is believed that the building was built around 1830 by Alexander Campbell and originally a grocery store occupied the first floor. The second floor was occupied by Judge Caleb Burbank’s and William Freeman, Sr.’s law offices. In 1865, Martha N. Patten bought the building from Alexander, David W. & Francis C. Campbell. Her husband, Frank W. Patten, operated a cobbler shop on the third floor. Many businesses were carried on in this building over the years: a barber shop, telegraph office, photography shop, and insurance, to mention a few. The first floor of each building served as a grocery store for years. Frank E. [B?] Patten ran a meat market. John Monohan and U. G. Gardner had groceries. We would appreciate hearing from persons who knew of different businesses located in either building and the years that they were there. Please send a list to the editor. Much work needs to be done on the building before it can be used as a museum. We have a few volunteers; we could use a lot more. Not much can be done until spring. Ellsworth Building Supply has offered to donate some materials, Another person has offered to donate paint for the outside of the building. All donations are most welcome. A second sale was held in November. The raffle prize was a radio, won by Leonard Willey. The door prize went to Anita Merritt. There was a guess cake, made by Margery Brown. No one made the correct guess; it contained a small paper American flag. Proceeds from this sale were $210.00. The Bicentennial celebration in Cherryfield on the weekend of July 16-18 was a huge success. The rain on Saturday forced cancellation of the parade until Sunday afternoon. It was a beautiful day, there was a large crowd, and all of us were having a grand time with the first parade in Cherryfield in many a year. The Bicentennial committee, under the leadership of Chairman Mrs. Jessie Santerre, did a wonderful job. The Historical Society Museum, located in the Nash Carriage House, was open Friday, Saturday and Sunday afternoons that weekend. About 70 people came in to view our exhibits. The interest and enthusiasm shown by the visitors was most gratifying to those of us who worked to set up the exhibits. At present the museum is open by appointment, except during the winter by contacting Margery Brown. The Committee used the money left from the Ball to buy trees which they planted in front of the Town Office (former Academy Building) in place of the elms which have been cut. The next newsletter will report on our progress in having old records and books microfilmed; books that we plan to have reprinted for sale, and perhaps a partial list of items that have been donated to the museum. Our meetings are held the second Wednesday of each month at our building on Main Street. Come and join us around our pot-bellied stove. It was decided to name the Bar Harbor Banking and Trust as an honorary member in appreciation for the building. It was also decided to keep the membership dues at $1.00 for the coming year. Your dues and donations are what helps the Society reach its goals of preserving local history. All donations are tax-exempt. Joseph Foster, aided by John C. Fralish, Jr., compiled our by-laws. The name Cherryfield-Narraguagus was chosen because a part of the present town was once the village of Narraguagus, part of the town of Steuben and we hope to include all towns of the Narraguagus Valley in the Society. Our by-laws are are such that any records and artifacts collected pertaining to a given town can be turned over to a Historical Society that may be organized in that town sometime in the future. Mr. Fralish, a of the Cumberland County Historical Society of Carlisle, Pa., was vacationing in town this summer, We ato him for all his help. Among other things he cataloged three cemeteries complete with maps. The Small, Old. and Willey Hill cemeteries. a listing of all the known cemeteries (names and dates) in Cherryfield thru the work of Ruth (Robbins) Myrick, Larry, Ted and Margery Brown. Ruth also has lists of most of the cemeteries in Steuben, Milbridge, Harrington and Columbia. We are grateful to the Union Trust Company for furnishing us with copies of the 1896 “birds-eye view” map of Cherryfield. We are selling these for $2 as a fund raising project. We have been given quite a few books, papers and artifacts and the promise of more once we have a place to display them. We hope to have a museum if we can locate a building to use. At present we are working on plans for a Bi-Centennial Celebration. The end of the year finds us with 121 members and $264.80 in the treasury. Microfilming of the Narraguagus Times that are in the County Court . Does anyone have copies prior to Nov. 1899? First issue July? 1896. Cataloging of the Older Houses in Town. Do you know when your house was built?, by whom?, how many different families have called it “home”? If so will you write it down and send it to us? A Building to use as the Cherryfield-Narraguagus Historical Society Museum. Does anyone have an unused building available? May 5, 1818 One Captain, one Lieutenant, 4 sergeants, one drum, one fife, 48 rank and file, 32 muskets, 32 bayonets, 32 cartridge boxes, 31 iron ramers, 32 scabbards and belts, 55 flints, 27 wires and brushes, 14 knapsacks, 402 cartridges with balls. * Who was Elijah Willis? I have never come across the name Willis in any of the material that I have read so far, nor can I place this Campbell. There may have been a name before the initials. Some of the writing in that book was difficult to read. The Society meets the 2nd. Wednesday of each month at the Cherryfield Academy Building. I invite each and everyone in Cherryfield and surrounding towns to join with us to make this an active, interesting and informative Historical Society. Dues are $1.00 a year payable January of each year. Enclosed is an application for your convenience.